For those who may not know, the Julian Carr Building was renovated over the last year (gutted basically) and just opened in late August as the new campus building for the 6th and 7th grade classes at DSA. The look of the old building remains but the interior is brand new and state of the art. It has a gym, 4 science classrooms, 12 smaller classes, a few offices, a dance studio, amazing art space in the basement, and a cafeteria on the 3rd floor. My daughter is a 7th grader in the building this year and it is amazing. Drive by and take a look if you live nearby, or attend the Dedication currently set for Saturday, Sept. 10, 2011. It took a bond referendum to get it done I think, but the space was much needed (6th graders were previously housed in the basement of the main building...nicknamed the 'Dungeon'). There are approx. 200 students in each of the 2 grades now learning in the building. Attended Carr Jr. High for 7th, 8th and 9th grades, then on to DHS class of '73. Great memories of Carr. In the fall the tobacco warehouses would open and the smell would waft through the open windows of the school. Brodie Duke, the eldest of Washington Duke's children, was the first of the Duke clan to recognize the potential of Durham in expanding tobacco production and transport. Brodie was born in 1846, the second child of Washington Duke and Mary Caroline Clinton. His mother died when he was 1. Washington Duke remarried, to Artelia Roney and had 3 children, Mary, Ben and James. In 1858, both the eldest child, Sidney, and Artelia died. Brodie thus became the oldest surviving child, and the only surviving child of his mother. He served - possibly impressed into service - as a scrawny youth in the Confederacy, stationed at the Confederate prison in Salisbury, NC. At the end of the war, he tried farming shares with his uncle William Duke, as Washington Duke and his remaining children began to create their own small manufacturing venture. Always a bit of an outsider to the machinations of the rest of the Duke family, Brodie struck out on his own from his father's business. Brodie was the first of the Dukes to move to Durham; he purchased a frame building on Main Street to set up his own business in 1869. He lived upstairs and manufactured tobacco downstairs, calling his brands "Semper Idem" and developing the soon to be famous "Duke of Durham." It was evidently during this time that he first succumbed to what would become a lifelong battle with alcoholism. In 1874, the remainder of the Dukes saw the opportunity presented by Durham - Washington Duke sold his farm and moved to Durham, building a frame tobacco manufacturing building on West Main St. - this building had separate partitions - one for Brodie Duke's business, and the other for Washington Duke's - although they initially had a 'mutual assistance' arrangement where each would sell the other's products. Brodie built his own tobacco warehouse - located at present-day Liggett and Corporation Streets around 1878. Around this same time, he joined with his father and the other sons to form W. Duke and Sons Tobacco Co. 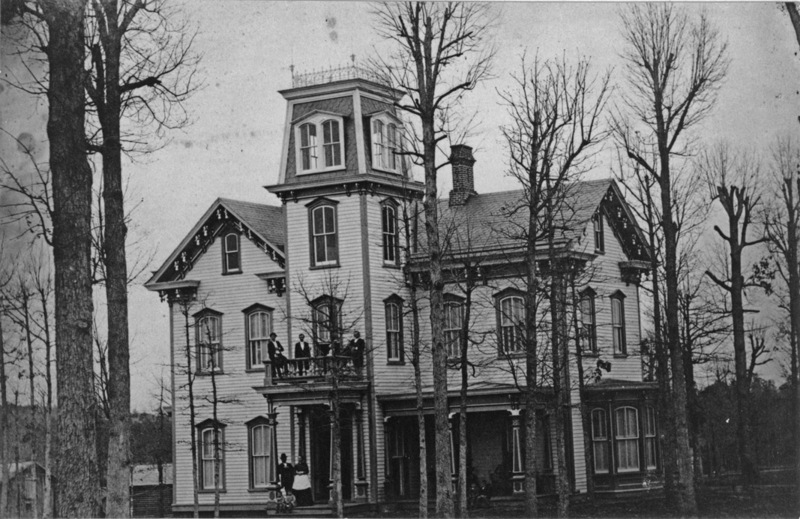 Sometime during 1870s, Brodie married his first wife, Martha McMannen, daughter of John McMannen (who developed the houses on McMannen Street.) Brodie Duke, although he owned shares in W. Duke and Sons, was not engaged in the day to day operations of the business - I get the feeling that the remainder of the family preferred it that way. Brodie, perhaps by virtue of being first on the Durham scene, but perhaps because he didn't remain as completely engaged in building a tobacco empire as his father and two half-brothers, Ben and Buck, accumulated a great deal of land on the west side of Durham, including most of what would become Trinity Park. He built his own estate on a 15 acre plot of land sometime prior to 1883, just one block west of his tobacco factory. The street we now know as "Duke St." is so named because it initially led to (and ended at) his house and land. He also built mercantile establishments and office buildings downtown - which did not fare so well. The first, near Main and Church Sts., was destroyed in a large Durham fire in 1881. Another, the five story brick office builing called the "Brodie Duke Building" in the 100 block of West Main St., was where a disastrous 1914 fire started that destroyed the entire block. Brodie's life seemed to be a series of such advancements and reversals - he bought the Bennett Place in 1890 and built a shell around the outside to try to preserve it - so that he could try to sell it to the World Columbian Exposition of 1893 in Chicago. He had no takers. He invested heavily in cotton textiles- including the Commonwealth Cotton Company and in establishing the Pearl Cotton Mill just northeast of his estate in 1892. In 1891-2 he traveled to Illinois to receive the "Keeley Cure" - for alcoholism - and returned ostensibly sober. By 1893, he had declared bankruptcy, the mills were taken over by his brother Ben, and Brodie fell back into a pattern of "indulging in whiskey and women." However, this did not stem his contributions to the development of much of what we think of as 'historic Durham' today. Having amassed large quantities of land extending from Trinity College through present-day Old North Durham and Duke Park (one source notes his acquisition of "150 acres at $10 an acre",) Duke awaited the establishment of a successful streetcar system to develop his land. The planned trolley extension into future Trinity Park, known as the Dummy Street Railway, failed before it could get off the ground. However, after Richard Wright successfully started the Durham Light and Traction Company in 1901, Duke began subdividing land and selling off parcels in Trinity Park and North Durham. Duke initially named the streets in Trinity such that Gregson St. was named "Hated St." Thus, his antipathy for George Watts - who as a strict Presbyterian no doubt disapproved greatly of Brodie Duke's lifestyle - was expressed each time a person read a map or traveled east-west. The streets would read (depending on the direction of travel) "Duke - Hated - Watts". 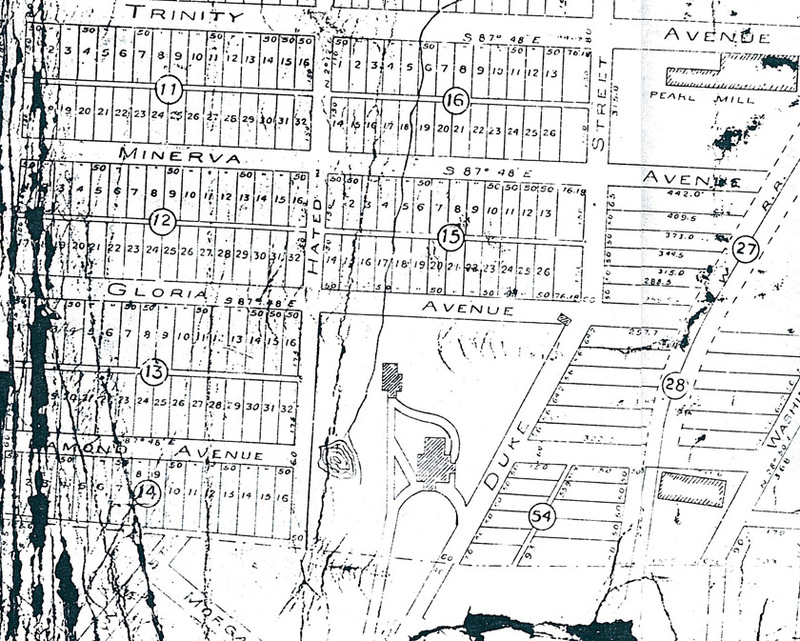 1901 plat map of Trinity Park, showing Duke's house and "Hated Street." Brodie was divorced from his second wife by 1904 (a quite unusual occurrence at the time,) and while on a multi-day bender in New York City during his younger brother Buck Duke's wedding, ended up married to his third wife (to whom he had also given several promissory notes and various prenuptial promises- for how much cash isn't stated.) The Duke family lawyers obtained a warrant for Brodie's commitment to a sanitarium, pleading a temporary insanity due to intoxication. He managed to successfully sue for divorce on the grounds that he had no recollection of the series of events. The brothers were not at all close after Brodie's 'night(s) in New York' and subsequent events. Brodie had to put his wealth in the care of trustees during this event, and appears to have laid just a bit lower over the next several years. Despite his wayward ways, he seemed to evince some of the same streak of civic and educational generosity that possessed the remainder of his family. In 1886, he had donated the land for the Main Street Methodist Church. In 1910, Duke donated two lots of land for the King's Daughters Home on Buchanan Blvd. with a $500 "nest egg", and evidently named the intersecting street Gloria, "because of the glory of being able to aid such a cause" - that cause being the the provision of shelter and care to elderly women. He also donated the land that became (Brodie) Duke Park. Also in 1910, Brodie married his fourth wife, Wylanta Rochelle. As Robert Durden puts it, Duke would pass by the Rochelle family home on his walk downtown and stop by the front porch to argue with the Rochelle patriarch, who was a Democrat (Brodie, like all the Dukes, was a staunch Republican - although these were quite different categories than present-day.) The fact that Wylanta Rochelle was 40 years his junior was probably of less concern to the rest of the Duke family than simply ensuring that the groom (and bride) had actually made a sober commitment. 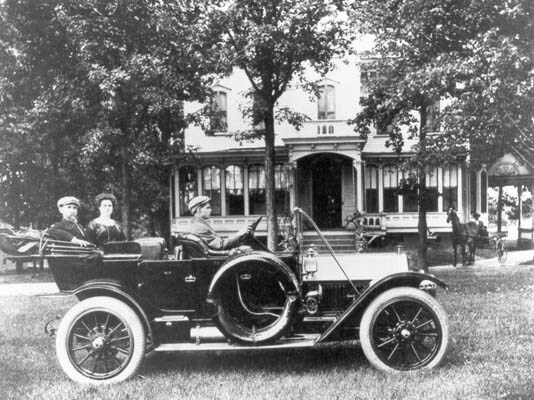 Wylanta Rochelle and Brodie Duke in the back of his Cadillac, 1912. He died on February 2, 1919; per Robert Durden in "The Dukes of Durham", Brodie died unreconciled with his half-brothers, and neither attended his funeral, a ceremony held in his home - although Ben Duke was quite ill at the time. The city high school (for whites) on Morris St. had become quite crowded, and the availability of Duke's land presented the opportunity to develop a new high school with ample facilities. 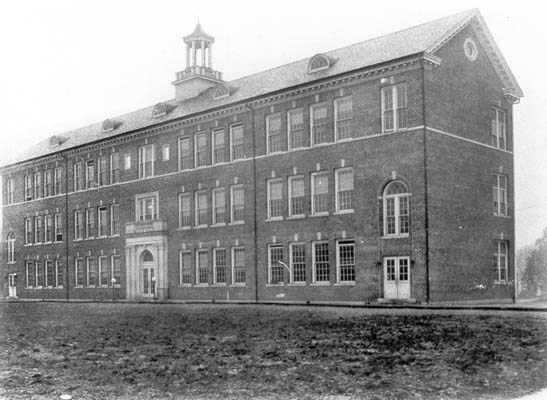 In 1922, construction was completed on the new high school building, built just to the north of Brodie Duke's former house. The school was designed by Milburn & Heister, a firm responsible for many of Durham's most impressive civic buildings; the company was engaged at the same time in transforming the former high school into a new City Hall. The completed Central High School (soon known as Durham High) and Brodie Duke's house, 1926. By 1928, a newly centralized Junior High School, named for Julian Carr, was completed at the southern extent of Duke's former estate, facing Morgan Street. The school was designed by George W. Carr. Julian Carr Junior High, 1930. Looking west-northwest from downtown at the completed Junior High, High School, and Brodie Duke's house. Duke's house remained on the school site for at least 6-7 years after construction of the high school. There was evidently a large fish pond in back of the house that the students would mine for biology class specimens. Likely sometime around 1930, the former house was torn down and a home economics building for the high school was constructed near its former location. Looking northwest across the Liggett-Myers complex to the Carr Junior High and Central High School, ~1930. The Brodie Duke house may still be standing in this picture - I can't decide. 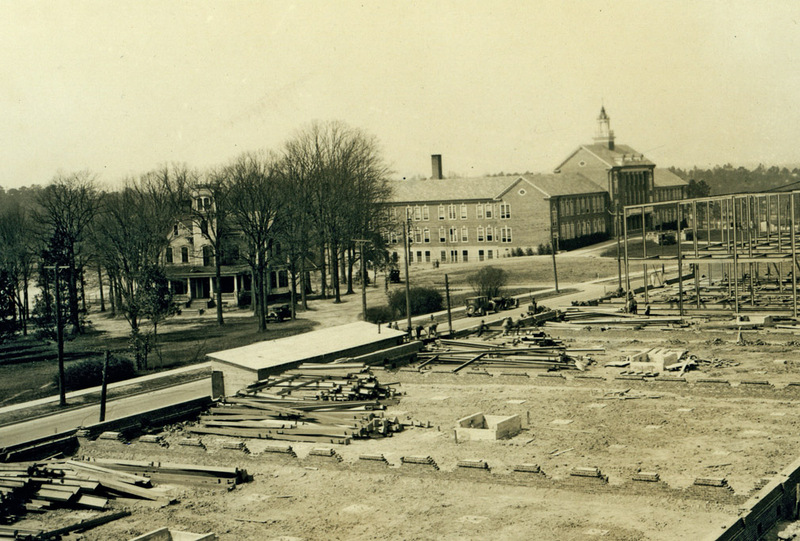 A view of the high school from near Trinity Avenue, date unknown, but likely mid-1930s to 1940. A bit of the home ec building is visible at the left edge of the frame. Duke's house is certainly gone by this time. Below, a ~4 minute excerpt from H. Lee Waters' films of Durham, showing the high school and junior high, lots of student shots, and some interesting views of the surrounding streetscape - late 1930s or 1940. Looking south from ~ W. Trinity Avenue at the full extent of the high school and junior high campus - the gymnasium is at the northeast corner of the campus - early 1950s. Below, Carr Junior High in the 1950s. Carr Junior High, 1950s, looking northwest. The Durham city schools began a slow, slow march to integration by admitting the first African-American students as transfers to Durham High and Carr Junior High in 1959. The process was a transfer policy - in which students could apply for transfer to other schools, but race could supposedly not be used as a deciding factor - rather than a true integration policy. Can you imagine how brave this first handful of students must have been to enter previously all-white schools? The resistance of the school board to desegregation slowly ebbed over the 1960s, as the trickle of transfers became a stream. Per Jean Anderson, white flight and a sudden proliferation of private/parochial schools pushed the shift even further, such that when court-ordered integration finally occurred in 1970-71, the district's population was majority African-American. Carr Junior High closed in 1975, and that building became part of Durham High. In 1993, Durham High School ceased to exist as a traditional high school, and in 1995 re-opened as a magnet school, Durham School of the Arts, graduating its first senior class in 2000. The former Carr Junior High, looking north, 12.09.07. In 2011, the former Junior High building was completely renovated.